For many couples, Trying to Conceive and Pregnancy can be a very long and emotionally draining process, especially if there have been one or more previous losses. When your greatest desire is to conceive, carry, nurture, and raise a child of your own, it is heartbreaking and devastating if you are not able to do so. The outside world may not understand or be insensitive to your struggle and lonely journey. Our Fertility Jewelry and Pregnancy Jewelry is created from natural genuine gemstones with special metaphysical properties and sterling silver charms with symbolic meaning which have been traditionally used to enhance fertility, conception and healthy pregnancies in cultures around the world. The genuine gemstones we use have mineral properties and energies which are thought to decrease negativity, stress and fear; while promoting positive energy, relaxation, tranquility, confidence, love, luck, hope, reproductive health, emotional and hormonal balance. Our Fertility and Pregnancy Bracelets, Pendants, Necklaces, and Charms are soothing to the touch and aesthetically pleasing to the eye. 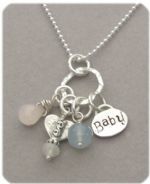 All of our Fertility and Pregnancy jewellery is created with .925 Sterling Silver, and is Lead-Free. A jewelry pouch and card explaining the gemstones and symbolism is included with each purchase, perfect for sending as a gift of encouragement! Please note that the jewelry or gemstones is not intended to diagnose, prevent, treat or cure infertility or any medical condition. Always discuss your medical concerns with your physicians. Wearing our Fertility Jewelry and Pregnancy Jewelry is a visual reminder to think positively and ready your spirit to nurture new life. Believe, Hope, and Pray for Miracles! Fertility Jewelry and Pregnancy Jewelry product lines. I've been making this special Fertility Jewelry since 2003. They are designs based on my gemstone knowledge as a Graduate Gemologist and my personal journey of two successful subsequent pregnancies after the stillbirth of my son. I found comfort, focus and strength in wearing jewelry with symbolic animals, affirmative words, and natural gemstones which have been traditionally used to promote fertility and healthy pregnancies in cultures around the world. I hope you enjoy my Fertility Jewelry as much as I love creating it for those who seek a little extra positive energy along their pathway to motherhood. Best Wishes! "I wanted to let you know, my bracelet was worth the wait!!! I wore it to my fertility specialist appts. and it gave me a sense of calm and that everything, however it turned out, would be OK. It is beautiful to boot and have gotten several comments about it. I have shared it on my fertility support group forum and hope you have many more orders to come! Thanks again for creating beautiful jewelry for such a beautiful cause! ~Laura R."
"I got pregant this last time! I wore a fertility charm! ~Cynthia W."
hopefully conceive and have a child of my own. ~Stacey"
"Dear Sue, I wanted to thank you so much for the beautiful TTC/ Pregnancy bracelet. I bought the bracelet for one of my best friends who lost her baby boy 9 hours after his birth due to placental abruption last year. My friend is pregnant now and is expecting another baby boy in January. I have been searching for something to send her for so long and I'm so glad that I found your site. 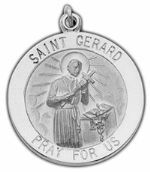 God Bless you and thank you for the jewelry you have created. 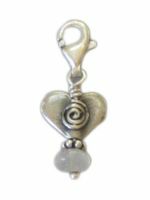 ~Caryn V."
"I received the fertility bracelet with mixed gemstones & sterling and I just wanted to tell you how much I LOVE it! It is soo beautifully and exquisitely made! Thank you for taking the time to listen and make necessary changes-it fits perfectly! Thanks again! ~Donna M"